Is this not your Father’s Oldsmobile? Buzzed, pumped-up, enthusiastic … these aren’t the adjectives one expects to hear after shaking 2,300 hands and talking to 2,300 people, but they were the ones I was using after our last Arts Convocation on Friday. For three days, I had congratulated each of our graduates and asked them a variety of questions, the most common of which involved getting to know their plans for the next phase in their lives. 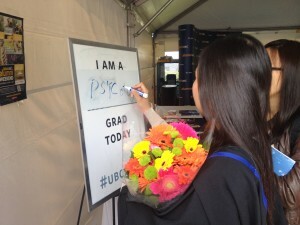 Trying desperately not to hold up the line, I still try to get in a little banter with each student – it’s my exit poll regarding their education at UBC and their hopes for the future! Those around me on the stage often ask what I’ve learned, and I have to admit that it’s difficult to summarize. But I try to recall the really different and interesting things our students are off to do as well as the general trends. So let’s start with some of the choices that were less common, more “off-the-beaten-path”. • We’re graduating at least three professional athletes (this year we had a football player, a hockey player, and a baseball player all headed to the professional leagues), a swimmer training for the Rio Olympics, and someone just back from the world competition in cheerleading! • I met a couple of future police officers, a fire fighter, someone headed to the armed forces, someone hoping to join the UN police, three who were off to become pilots, and one who was planning to work in the gas industry in the North. • A few of our graduates are already working in government (MP offices) and one for the Liberal Party of Ontario (stepping right into an election cycle!). Not a single one of our students intended to work for Mayor Rob Ford of Toronto. • At least three are working in aquariums (!) and a surprising number are working, at least for a while, at UBC (for example at MOA or in various central offices). • Of our graduating librarian and archival students, one was working in the Vancouver Public Library, one for an archives, and another for a Vancouver area library. Similarly, our journalism students were heading to the CBC (2), to CTV and to a variety of print and electronic media. Most of these professional school students seemed to be already working! We know our co-op students are 90% employed by graduation, but I was heartened by the job prospects of our professional school students. • Many of our Economics students were already working in banks or in finance or as brokers. Quite a significant number were heading to Hong Kong, Shanghai, Tokyo or Singapore with jobs already in hand. • Many are off to do graduate or post-baccalaureate work in their fields, and a quick poll of where many were going turned up Oxford, the California system, NYU, Stanford, McGill, UofT, The University of Chicago, Columbia University, or to universities in Australia, Hong Kong, the Netherlands, Germany, mainland China, and beyond. The most popular post-BA destination seemed to be Law and Education, both accounting for at least 100 students. One, though, was going on to seminary to become a missionary. For those wanting to combine something closer to technical training with a BA, they most often mention BCIT as a destination (a few were becoming designers of one sort or another). 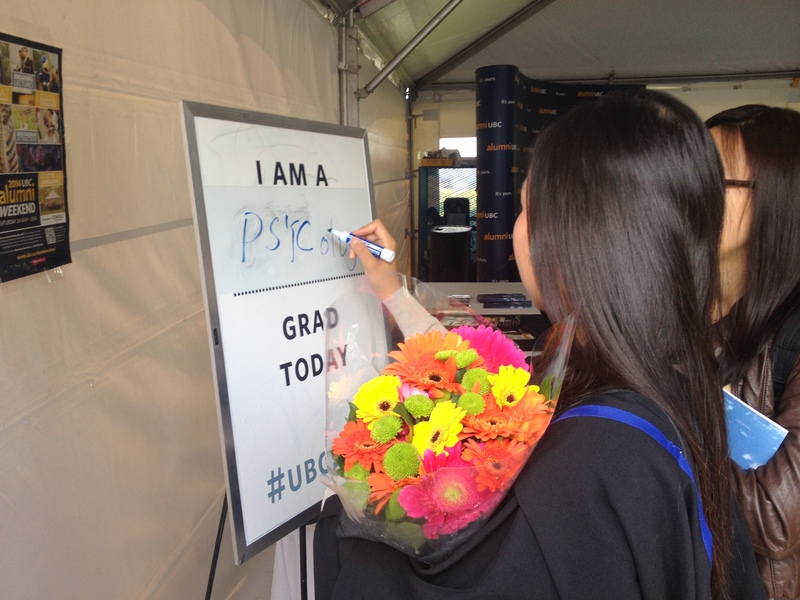 We have a few who are going on to Nursing, many to Occupational Therapy, Accounting (typically here at UBC), and many to Human Resources, and among our geographers, some were getting additional training in Global Information Systems (GIS). In theses cases, the combination of an Arts degree (perhaps Psychology, Economics or Sociology) and a technical training component will likely prove to be a strong combination for their rise to leadership in their fields. • And one student mentioned her graduate studies in “forensic linguistics”. Okay, so as background, let me say that I work (on the side) as a forensic musicologist, providing expert witness testimony for music copyright cases, but I confess that I have absolutely no idea what a forensic linguist would do! Someone help me by writing into this blog to clarify please! • A number of our students planned to work in their family’s business (very true of some of our students from China) or to start a business (some had started businesses already) and one was already working in a start-up and hoping to move up with the business. • Sometimes the students don’t talk about their detailed plans but state ambitious goals: “Change the world!” or “The world is my oyster!”, and sometimes they respond with a much shorter timeframe in mind: “Sleep”, “Party”, “Lunch” or even in one case “Sushi!”. And although the following answer does not impress the Provincial government, some of our students shrug their shoulders and say: “We’ll see!” But the odd thing is that this was never said in a downbeat or pessimistic fashion but more along the lines of “We’ll see what great things come my way!”. Another variation on this was the decision to take a year to travel and work before getting onto more permanent work or graduate school. • And yes, just because this is an Arts faculty (and here I’m playing with the stereotypes! ), one student did say “barista” and one was continuing to work as a server at a restaurant on West Broadway, and indeed one said “unemployment”, but it seemed to be said lightly. Only one student tripped (on the way down the stairs) but several lost their mortarboard hats on stage (it is one of my duties to pick these up!). There is no logical explanation for the design of mortarboards, but if future graduates are reading this blog, my recommendation is to bring bobby pins to keep them on your head! Along with the handshakes came a few high-fives, a couple fist bumps, and a few hugs. I got to pose for selfies, turn around for pictures by parents, and comment on some interesting choices in footware or body adornment or on the relative merits of the students’ professors, who were sitting behind me. And of course I followed it up with a quick trip to the Purel dispenser. But there’s nothing like a sea of excited students and proud parents, a rendition of “O Canada” led by our Opera Program Director Nancy Hermiston, some stirring march music played by the School of Music brass students, a sea of flash cameras, and the sheer exhaustion of it all to leave one, strangely, wanting more. I was buoyed considerably by a comment to me by our outgoing Chancellor, Sarah Morgan Sylvester, who finds Arts students much more optimistic and full of spirit than she did five years ago. Can I conclude this little sampler blog about our Convocation with the biggest props possible for our outgoing Chancellor as well as our outgoing Vice-Chancellor and President, Stephen J. Toope, both of whom do about 22 convocations every spring with unflagging enthusiasm and dedication to our students as well as the heartfelt and thoughtful speeches that they compose for each convocation season. Their stamina and commitment to students continues to inspire. 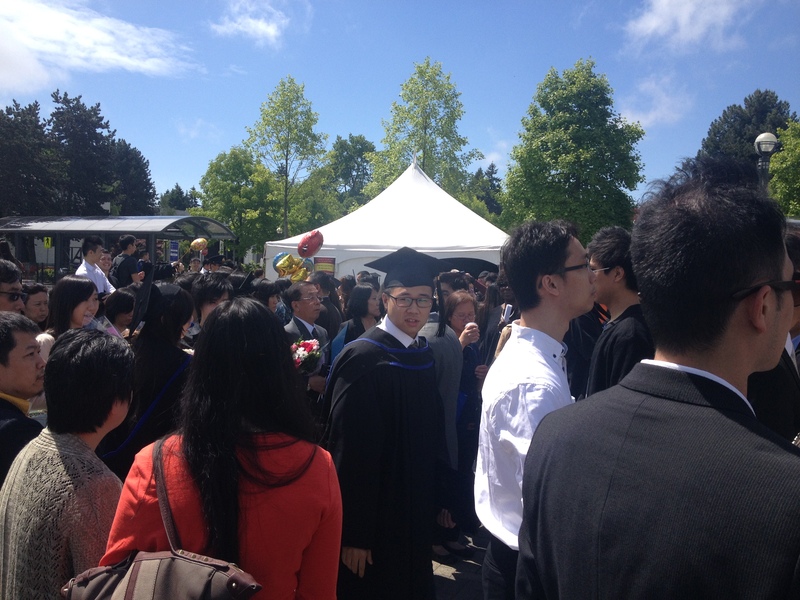 Congratulations to the extraordinary UBC Arts Class of 2014. I’m exhausted and exhilarated just thinking about it! Posted: 05|24|14 at 9:13 pm. Filed under: Uncategorized.